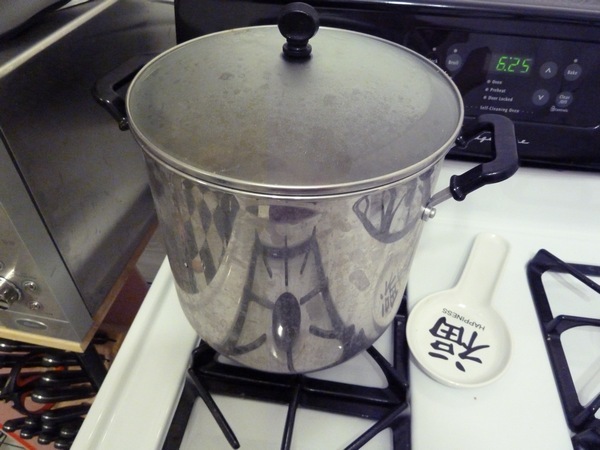 So, after you give out ten quart-sized bags of chicken katsu and no one wants to take home the Japanese curry, what do you do with the monstrous pot of vegetables and spices? Well, you don't eat curry and rice three days in a row. You will die, believe me, I know. So to try and mix up the curry a little, I took a page from Lauren's post about petite lasagnas. They were so cute, can't I make uh, curry lasagna? I didn't have a mini muffin pan, so I made do with a normal sized pan. I still think it works! Leftovers in a wonton..in a pan! 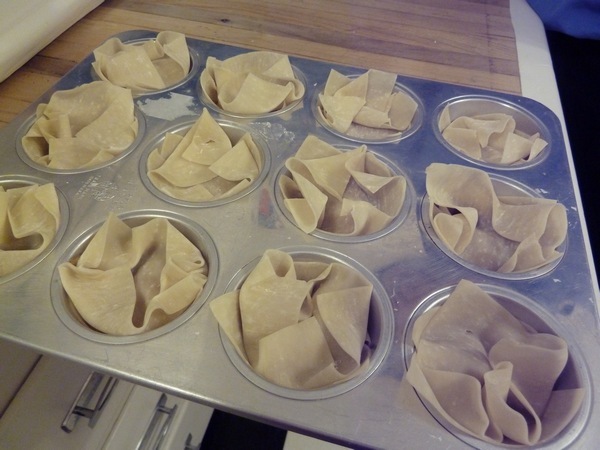 I smooshed another wonton wrapper on top for some sort of "lid". And then baked per Lauren's instructions of 375 degrees for 18 minutes! Seriously, I was not expecting these to be very good. Come on - it's three day old curry! But it wasn't bad! 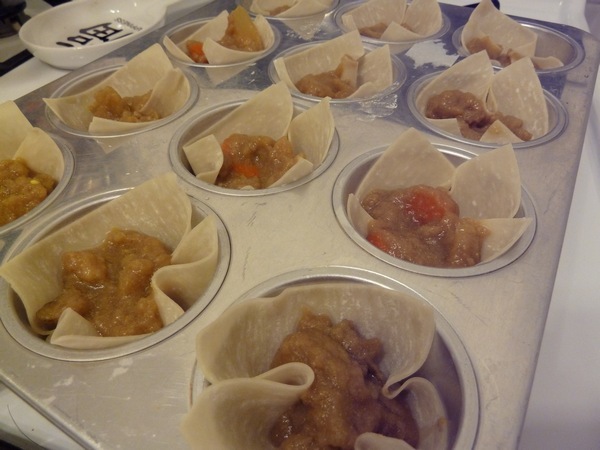 The crispy wonton went very well with the mooshy curry, kind of like a dip on a chip. Had I thought of this earlier, I would have just served these at the party since they are much more finger friendly. A little red curry pickle on top for garnish, and it would've been super cute! All out of curry pickles, sadly! Anyway, thanks Lauren for the inspiration! Next time I'm going to try them with samosa filling I think, yum yum! 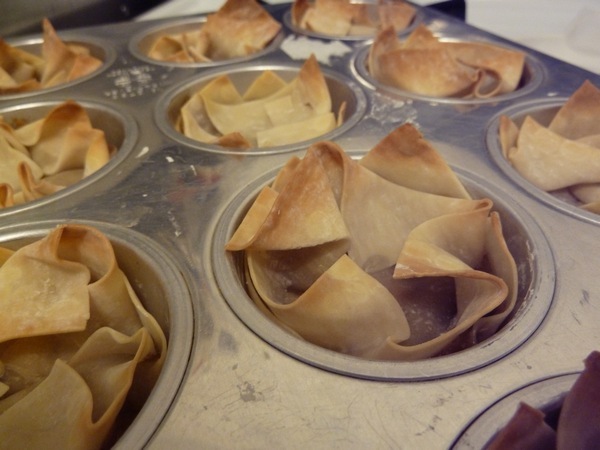 What else can I stick in a wonton wrapper and bake? I'm thinking maybe just about anything! We totally bought some of these wrappers last week and LOVE them. How timely! 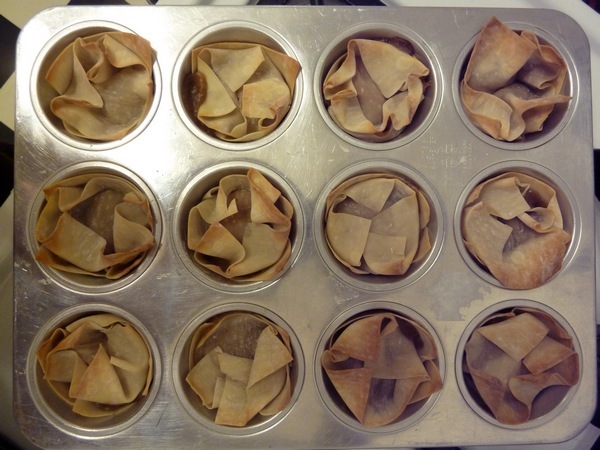 We used them to make sweet potato ravioli, but now I'm really excited to try baking them for something like this. Nom nom. what a great idea! love the idea of a little curry bite. Now that's one I've never seen before - I'm always trying to think of ways to use leftover curry because I tend to cook too much also. I make: kare korroke, kare udon, kare gyoza (http://lunchinabox.net/2008/03/01/leftover-remake-curry-gyoza/), and I really want to attempt kare-pan (http://www.justhungry.com/japanese-curry-bread-kare-pan)! Genius! 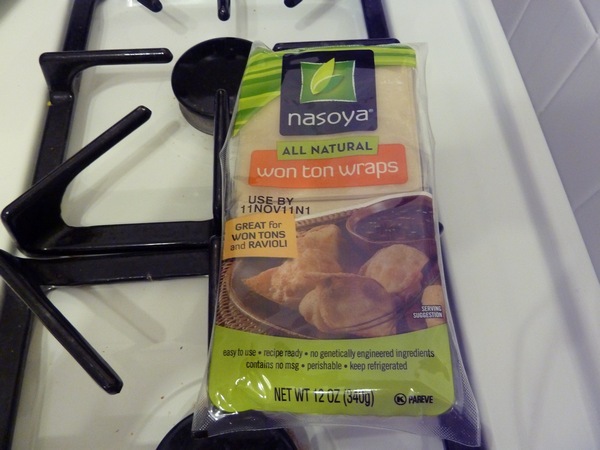 Would normal Chinese wonton wrapper things work? You don't need to do anything to the skin but bake them? LOVE IT! I've started to get kinda adventurous (or random) with what I throw in them to use up left over won tons. @alvina - its just a normal wrapper (although the pricy safeway brand cause I was too lazy to go to ranch). I didn't put anything on it, but a brushed egg might make it look prettier? Sweet wwould be a good idea! 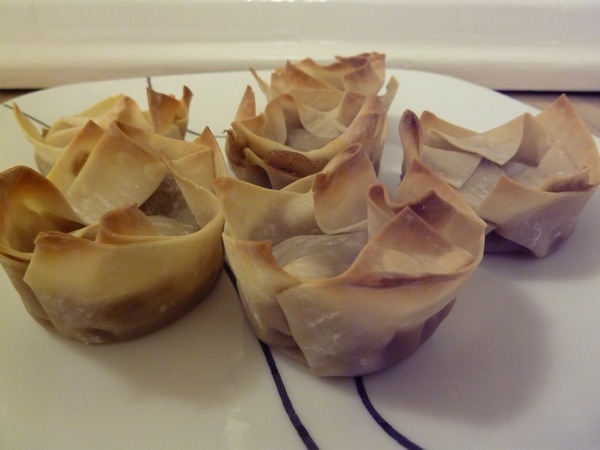 I bet one could make a whole blog solely on things to do with wonton skins. Lol. These are DELICIOUS stuffed with cheese. Fact.